Eighth-seeded Jennifer Dawson advanced to the quarterfinals of the Women's 45 division at the ITF Seniors World Individual Championships. LA JOLLA, Calif. – There are times when you’re on the tennis court and everything feels just right and you can do little wrong. It was one of those days for eighth-seeded Jennifer Dawson of Carlsbad, Calif. as she easily defeated Germany’s Katja Groeniger, 6-0, 6-1, in the third round to advance to the quarterfinals of Women’s 45 division of the 2012 International Tennis Federation Seniors Individual Championships at the La Jolla Beach & Tennis Club. On a mostly cloudy and blustery day with temperatures in the mid-50s, Dawson opened the match by holding serve and breaking Groeniger for a 2-0 lead. 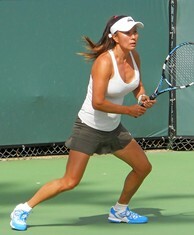 Dawson, a former collegiate player at the University of San Diego, simply had too much depth and pace on her groundstrokes as she began to dominate the German and went on to build a 5-0 advantage. In the next game, Dawson easily held serve to close out the set, which took a little over 20 minutes. Groeniger tried to rally with Dawson from the baseline, but was outmatched and when she tried to come to the net, Dawson responded with well-placed passing shots. Dawson, who won the United States Tennis Association National 40s Hard Court Championships last December at the LJB&TC, committed very few errors and was solid from the baseline as she broke serve twice in the first three games of the second set and established a 3-0 lead. Groeniger did manage to acquire a break point against Dawson’s serve in the next game and when Dawson’s shot sailed past the baseline, Groeniger raised her arms over her head to celebrate as she won her first game of the match. The German served at 1-3 as she attempted to make a comeback, but on break point against her serve, Groeniger hit a drop shot that Dawson tracked down and returned for a winner to secure the game and take a 4-1 lead. Dawson won the next game when she came in on a short ball on game point and hit a winner off her forehand approach to increase her lead to 5-1. Groeniger served to stay in the match, but as she faced her first match point, she double faulted to end the match in approximately 50 minutes. After the match, Dawson said she worked on her game plan to adapt to the wind. "I was just trying to work the point and keeping a few more balls in play, especially when it’s windy like this," she said. "You don’t want to go for too much and just try to find the court." Dawson, a tennis teaching professional at the nearby La Jolla Tennis Club, represented the U.S. in Young Cup (Women’s 40s) competition in last week’s ITF Seniors World Team Championships in San Diego. She helped lead her team to the finals, which fell to a strong French squad that featured former Women’s Tennis Association touring professional Sandrine Testud. When Dawson was asked how she felt about the opportunity to play in such prestigious tennis events like the ITF Seniors World Team and Individual Championships, she said, "It’s wonderful. It’s fantastic to be able to play people from all over the world. You play different people and different styles. It’s just a great experience and to have it in your backyard is just great. It’s been a wonderful event and it’s been a lot of fun." In other tournament action, fifth-seeded Jeff Greenwald, ninth-seeded Martin Barba and unseeded Douglas Failla of the United States all won their fourth-round matches in straight sets to advance to the singles quarterfinals of the Men’s 45 division at Morgan Run Club & Resort in Rancho Santa Fe.